Have a home that’s impossible to clean? Who you going to call? HouseJoy! That’s right. When it comes to any and all home cleaning needs – HouseJoy connects you with the best in the business. So if you’re looking for home cleaning services in Delhi or deep cleaning services in Delhi, all you have to do is book online through HouseJoy. All you have to do is select the kind of work you need and then pick a time and date that works best for you. The services offered are: Bedroom deep cleaning, Overhead water storage tank cleaning, underground sump cleaning, dining chair shampooing, office chair shampooing, deep home cleaning services, carpet shampooing, fabric sofa shampooing, bathroom deep cleaning, floor scrubbing and polishing, mattress shampooing and kitchen deep cleaning. Let’s learn a little about some of these processes. This service will probably take the longest and will require a bigger crew (depending on the size of your home). When you book deep home cleaning services, you can expect the following: scrubbing of the floors with a machine, vacuuming of the entire house and the upholstery, dusting of all furniture, shelves and counter tops, washing of mirrors, cleaning windows, wiping down of appliances and cabinet surfaces, clean the sinks and more. This is an essential service if you suspect your water is contaminated or the tank hasn’t been cleaned in years. The procedure involves mechanized dewatering of the tank followed by sludge removal and a high-pressure cleaning. It is then vacuum cleaned and then sprayed with an anti-bacterial spray. For sump cleaning, there is a proper six-step process which is similar to the overhead water tank cleaning. It involves dewatering, sludge removal, high-pressure cleaning, vacuum cleaning, using eco-friendly antibacterial agents and ultra-violet radiation to properly clean the sump. The technicians are experts and will bring all the necessary equipment. There will be a trained supervisor to monitor the entire process as well. Soiling of carpets can lead to the build up of many unhealthy contaminants including those that are airborne. Removing them can improve the indoor air quality and prolong the life of the carpet. Regular carpet shampooing and cleaning can prevent the build up of bacteria and allergens as well. Another shampooing service that’s essential is mattress shampooing. If you’ve always been looking for professional mattress cleaning services in Delhi, you’ll be happy to know that HouseJoy connects you with experts who make sure your mattress is rid of dust mites and dirt by vacuuming and steam cleaning. You can also get your dining chairs or office chairs shampooed through HouseJoy. This would take between one and two hours depending on the type and number of chairs. The process involves dry vacuuming the chairs and scrubbing the seat with a chemical solution. If required, wet vacuuming will also be done but the chair will be moist after the cleaning procedure. The same procedure will be done for fabric sofa shampooing but there will definitely be wet vacuuming so the sofa will be moist for a few hours after the service. The floor cleaning procedure aims at removing all stains and restoring the shine by using machines or brushes, mops and superior cleaning agents. They see that the dirt is removed from the pores – which would not be possible with the regular sweeping and mopping you do every day. If you don’t want the entire house cleaned, you can also book a deep kitchen cleaning service, bedroom deep cleaning or deep bathroom cleaning services. These services will take approximately an hour per room and will include scrubbing of floors, vacuuming, scrubbing of tiled walls, descaling of taps, wipe down of counter tops and cleaning of fixtures and fans. For all cleaning services, the crew will bring their own supplies which include machinery, mops, buckets, dusting cloths, cleaning agents, garbage bags, etc. Each crew consists of uniformed experts who have been trained in the latest cleaning methods. They do not use a one-size-fits-all approach to cleaning and will change their products and techniques depending on your needs and your space. The main benefit of booking an online cleaning service in Delhi is that it saves you so much time. And if you use HouseJoy to look for these house cleaning services in Delhi, you can rest easy knowing that your home will be in safe hands. 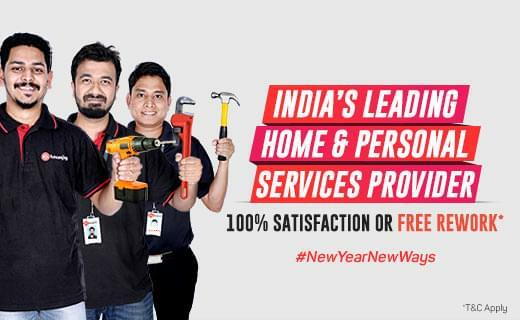 Every crew sent by HouseJoy is prompt and efficient. They use only eco-friendly products and will keep you informed of their progress at all times.